The SmartOmi Q5 True Wireless Earbuds were far and away the most popular truly wireless earbuds of the year in 2017. They offer great sound quality, impressive battery life, a smart design that fits comfortably in any ear, and a crazy value at just $40. Of course, our readers never paid $40 for them because we’ve always been sure to alert everyone when these headphones went on sale. Speaking of sales, anyone who missed out on these awesome earbuds last year is in luck on Tuesday. 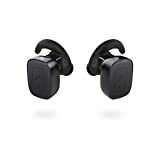 Amazon has a huge sale going right now that drops the price of the SmartOmi Q5 earbuds down to just $19.99 when you use the coupon code 72893TRB at checkout. That matches the lowest price ever, but the coupon code is only good while supplies last so you’ll definitely want to hurry and grab a pair now. ✔Genuine SmartOmi Q5 True Wireless Earbuds: feel free to enjoy crisp stereo music without the annoying wire when doing sport. The soft ear tips provide secure fit and avoid falling out during workout, fitness, exercise, running or gym. You may also share music without tangle wire. ✔Light Weight and Better Voice Quality: unbelievable light-weight with no burden to ears, the 8mm built-in microphone realizes clearer calls for you and the other side.You can mute/unmute your microphone during a call by double pressing MFB of the left earbud once. ✔Snap Pairing and Superior Connection Stability: the Bluetooth version 4.1 offers a hyper-stable connection within 10m/33 feet, compatible with all Bluetooth devices such as iPhone 7 / 7plus, 8 / 8s plus, X , S8, SE, Android cellphones, tablets or TV with bluetooth receiver. ✔Convenient One-key Design: just one-key to handle calls and enjoy music. Hands-free calling, last number redialed, third-way calling and incoming calls prompt, all your needs could be satisfied! The music will be auto-replayed to the wireless earbuds after hanging up. ✔Quality Customer Service: 60 days no reason return, 18 month warranty, 24/7 friendly customer service, please don’t hesitate to contact us if you have any question about our product and service.